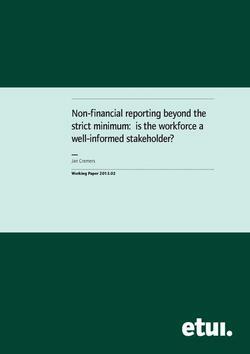 Home / Über WP.eu / Publications / Non-financial reporting beyond the strict minimum: is the workforce a well-informed stakeholder? In view of recent efforts at EU level to stimulate companies to go beyond the traditional financial and economic reporting, the results of the study are rather patchy and disappointing. Even in the best countries there is little evidence that non-financial reporting practices of companies go beyond traditional items. Moreover, workforce and workplace conditions are not seen as a key part of sustainability concerns and workers’ representatives are not sufficiently involved in the long-term sustainability policy of their companies. Last but not least, the crisis has placed labour organisations on the defensive in the sense that sustainability issues come to be perceived as a “luxury” at a time when labour law and collective bargaining are subject to organized deregulation attacks.